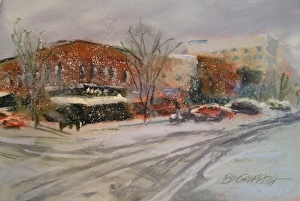 Using bold strokes with the side of the pastels I created a cityscape of the First and Main intersection and the buildings lining the street complete with snow flakes. I used my image on my cell phone as a reference and created a nice impression of Snow Day! So my message is…always be looking for an opportunity to paint…always have your camera, phone w/camera with you to record a reference shot…don’t wait for a sunny day to paint…and take a risk sometimes at what you paint! Snow Day – First and Main sold the same day it was painted. This entry was posted on Friday, February 22nd, 2013 at 3:05 pm	and tagged with weather, winter and posted in art, artist, artists, landscape artist, pastel artist, Pastel Dust, pastels, walla walla artist, walla walla pastel artist, walla walla pastel artist work. You can follow any responses to this entry through the RSS 2.0 feed.